Spokane's most devoted cat lovers were out in full force last night for the Internet Cat Video Film Festival, and we had a blast. There really is something special about watching hilarious and cute cat videos in a room with a bunch of other people who share the same level of cat passion as you (or close to it, anyway). Even though most of us, I'm assuming, had already seen most of the videos shown in the festival reel, we still laughed and "awwwwed" for each one. (The crowd seated in the bar area maybe a little more so.) But the biggest surprise was seeing several of the festival videos for the first time. Yes, even a cat culture freak like me hasn't seen everything out there. 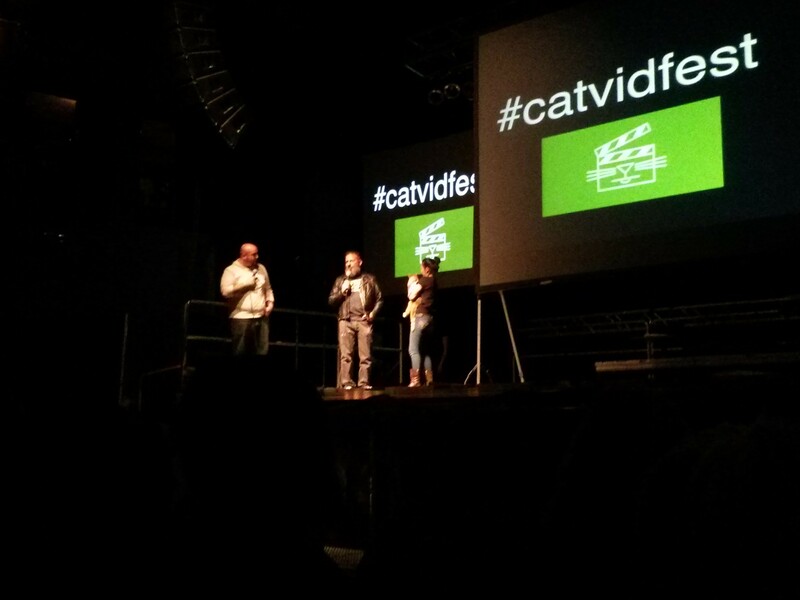 While the crowd was aware that Spokane's own Charlie Schmidt, creator of Keyboard Cat, would be at the event, the festival's other Pacific Northwest cat video creator host/guest wasn't as well-known as one might expect from a bunch of cat people. Will Braden talks to Charlie Schmidt as Bento the Keyboard Cat is introduced to the audience by Schmidt's daughter, Sydney. It's understandable, though, that most of the audience didn't recognize Seattle filmmaker Will Braden at first look, since he's not exactly featured in his own work, the black-and-white existential French musings of Henri, Le Chat Noir. But Braden clearly expected this and while introducing himself asked people to clap if they didn't know who he was. Almost everyone did. Several Henri videos were featured in the reel, and afterwards Braden graciously signed books and other Henri memorabilia, including a sizable stack of items an avid local fan of Braden's work brought with her. As for Bento the Keyboard Cat — he wasn't exactly free from stage fright. Bento made a quick appearance in his little blue shirt with Schmidt's daughter Sydney, but he appeared very anxious to get back to the comfort and quiet of his life away from the bright stage lights. It's okay, Benny, we understand! Readers who attended, what did you enjoy most? And now, a special BUB-date, as in a BUB update, not a date with BUB (although that would be adorable!). After the unfortunate debacle that arose following the mistaken announcement that Lil BUB would be at last night's event, I had a detailed conversation with BUB's dude, Mike Bridavsky, last week. Though Bridavsky and I chatted a lot about the challenges of scheduling appearances with BUB, and traveling with her (BUB is an excellent traveler, he told me, but it can be pretty stressful on him, and understandably so) he also shared many of the same thoughts posted on BUB's blog last week. Now that the event here's over, and was a success, we don't need to rehash what's already in the past. Instead, let's focus on some exciting upcoming BUB happenings Bridavsky shared with me. Soon, we can all own our own "BUB" in the form of the much anticipated BUB plushie, for which an official release date is to be announced in the coming weeks, Bridavsky says. "We've been working on it for a long time," he says. "It's really good. We went through like 10-15 prototypes before I was like, 'this is it.' As you can tell, I'm pretty picky." 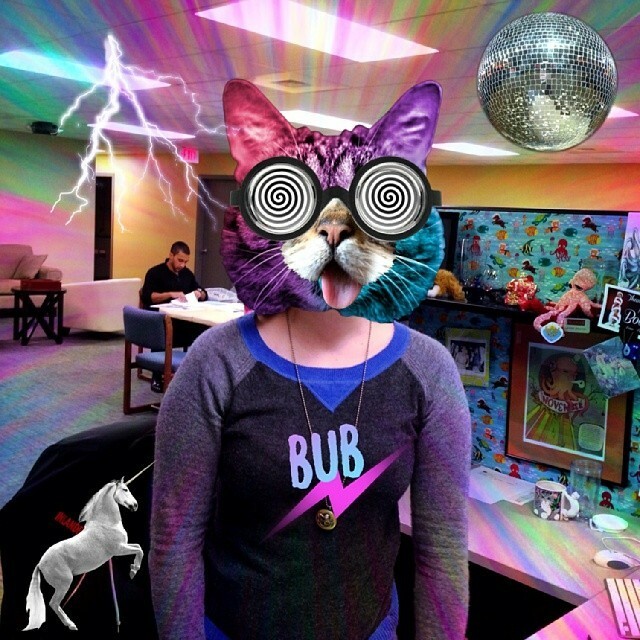 Testing out the new Power of BUB app at Inlander HQ. Before that announcement comes though, we need to put a couple of other important BUB dates on our calendars. The first is BUB's special appearance in Animal Planet's 10th annual Puppy Bowl, airing on Feb. 2 at 3 pm. And don't forget, of course, that Bento the Keyboard Cat will also be performing for the Puppy Bowl's epic half-time show. Then, the following week, Lil BUB's Special Special airs on Animal Planet, on Feb. 8 at 9 pm, starring BUB, of course, alongside special guests Amy Sedaris and Andrew WK. While you wait to acquire your own version of BUB in the form of her upcoming plushie, why not BUB-ify all your photos with the new Power of BUB app? Download it here. We tested it out here at Cat Friday HQ and definitely approve. Even more BUB news: BUB will soon be making another official announcement about Lil BUB's Big Fund for the ASPCA, which will become the first national fund designated exclusively to helping special needs pets, like BUB. "Even though a portion of everything [BUB makes] goes to shelters, as BUB has been getting bigger and more famous and more of a national thing, I felt like we needed a single, universal place to direct the money," Bridavsky says. Could the downtown library be moved to create more space for retail?